That bears a single star!" That bears a single star. Then came Alabama, who took her by the hand. Texas and fair Louisiana join us in the fight. Has grown to be eleven. Like patriots of old we'll fight our heritage to save. That bears a single star." Civil War Music: Bonnie Blue FlagNext to "Dixie's Land," perhaps no other song was as well loved by the Confederate soldier as "The Bonnie Blue Flag." Written by Harry Macarthy (1834-1888) and sung to the old Irish tune The Irish Jaunting Car, the song lays out the order of secession of the States that went on to form the Confederacy. The first flag of the Confederacy was a single white star on a blue background. This song, especially popular in the South during the early years of the war, counts out the eleven seceding states one by one. Macarthy was an English-born vaudeville entertainer who emigrated to the United States in 1849 and settled in Arkansas. He billed himself the "Arkansas Comedian" and traveled widely throughout the South in company with his wife, Lottie, putting on "personation concerts." These performances featured Macarthy singing in the dialect of other cultures, dancing to ethnic-sounding music, and dressing in flamboyant costumes. Stephen Currie, in Music in the Civil War, reports that one of Macarthy's traveling companions during the war years was a cockatoo who had been trained to squawk "Three cheers for Jeff Davis!" on stage. Although some claim that Macarthy was more interested in attracting audiences and making money than he was in supporting the Southern cause, his song was nevertheless an instant hit with Confederate soldiers and civilians alike. He premiered it during a concert in Jackson, Mississippi, in the spring of 1861 and performed it again in September of that same year at the New Orleans Academy of Music in front of an audience of soldiers headed for the Virginia front. The response was enthusiastic, and Macarthy was suddenly in demand as he had never been before. He traveled throughout the South during the war years, performing to packed houses of appreciative listeners, and although he continued to compose patriotic songs (among them "Missouri and The Volunteer" or "It Is My Country's Call." "The Bonnie Blue Flag" was his greatest success. The New Orleans music publishing house of A.E. 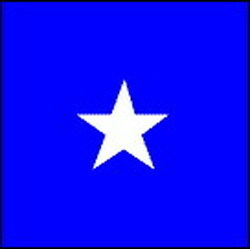 Blackmar issued six editions of The Bonnie Blue Flag between 1861 and 1864 along with three additional arrangements. The tune was so popular that Union General Benjamin Butler was said to have arrested and fined Blackmar for daring to publish it. of legend, a land of song, a land of hallowed and heroic memories. pulsation of my heart, is consecrated forever. rocked to sleep within her tender and encircling arms." ﻿ The name "United Daughters of the Confederacy" is a registered trademark of the General Organization and may not be used outside the Organization without the express written consent of the United Daughters of the Confederacy. The official UDC insignia is a registered trademark of the General Organization and may not be used without the express written consent of the President General.